New bag swap stations in local supermarkets aim to help shoppers who forget to bring their own reusable bags. Sustainable Neighbourhood volunteers have been working with local retailers to establish the initiative. It's a simple system, where there are clean reusable bags available for shoppers to use if they forget to bring their own. They can just return the bag next time they visit the store. Customers are also encouraged to donate their spare reusable bags for others to use. Various shops at Redhead Village, including Redhead Service Station, Café on Cowlishaw, Redhead Deli, Redhead Takeaway, The Bakehouse Redhead, Redhead Pharmacy, Life Rebel Chiropractic, Redhead Anglican Op Shop, Redhead Liquorland, Seaview Malayasian Kitchen, and the Joint Café. 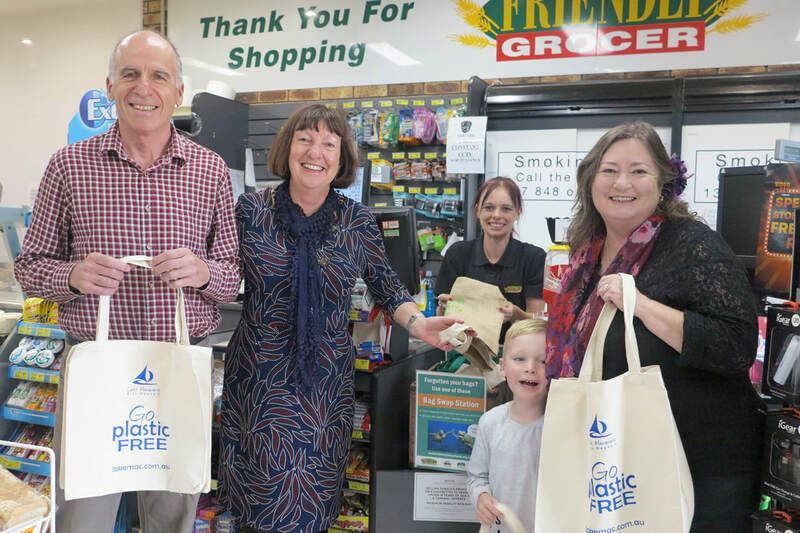 Local retailers have reported that their customers have been appreciative of the spare reusable bags. Lake Macquarie Mayor Kay Fraser (second from left), with Nico, Ami, Jack and Robyn. Robyn (LT Creek Sustainable Neighbourhood Group) and Steve (Toronto Area Sustainable Neighbourhood Group) at the Blackalls Park Friendly Grocer. Thank you to Sustainable Neighbourhood volunteers Steve, Robyn, Jody, Chris and Suzanne for setting up the bag swap stations in your local shopping centres! And thank you to our participating businesses who have enthusiastically embraced the initiative. You might like to set up something similar at your local shops. Start by talking with your local store manager about whether they would like to be involved. If they are keen, find out what kind of container would suit their store. We found a nice wooden box at an op shop. You could also use a basket, or even a coat rack to hang bags on. 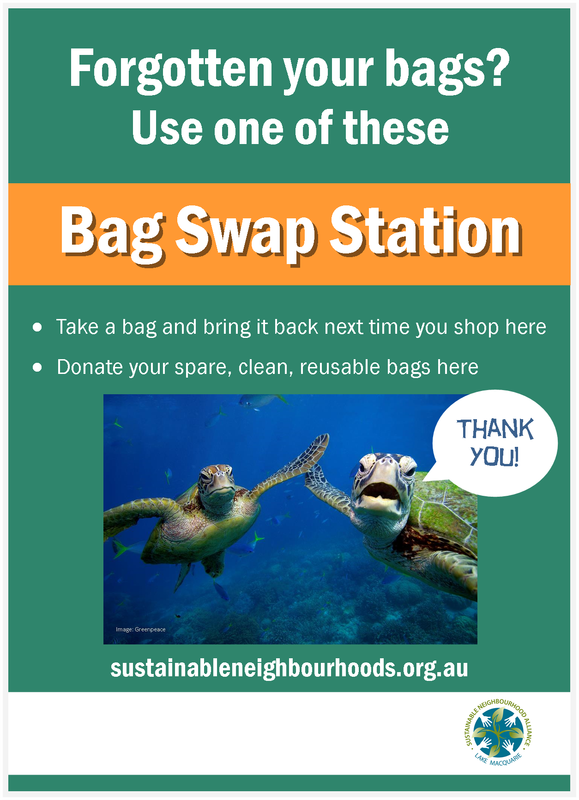 Let us know where the new Bag Swap Station is going, and we will provide some posters to display. We can also add your group's logo and the shop's logo if suitable. Set up your station, and pop in a few reusable bags to get it started. Check in with the store every so often to see how it is going. Feel great that you are helping your community avoid the dreaded plastic bag! Find out more about the Sustainable Neighbourhoods campaign to reduce the use of plastic bags.